President Bill Clinton White House baseball cap. 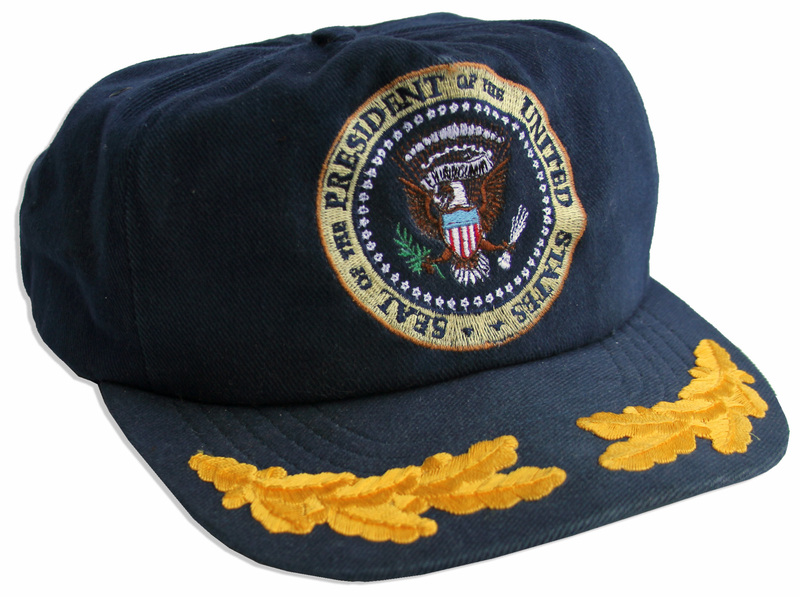 Navy corduroy hat features gold leaves embroidered to the bill and the official Presidential seal embroidered to front with ”The President” embroidered to back. One size fits all. With a COA from one of Clinton’s former photographers who was given this hat while working on a photography project at the White House in 1997. Near fine condition. The most expensive piece of Bill Clinton memorabilia that we have sold. Sold for $6,329. 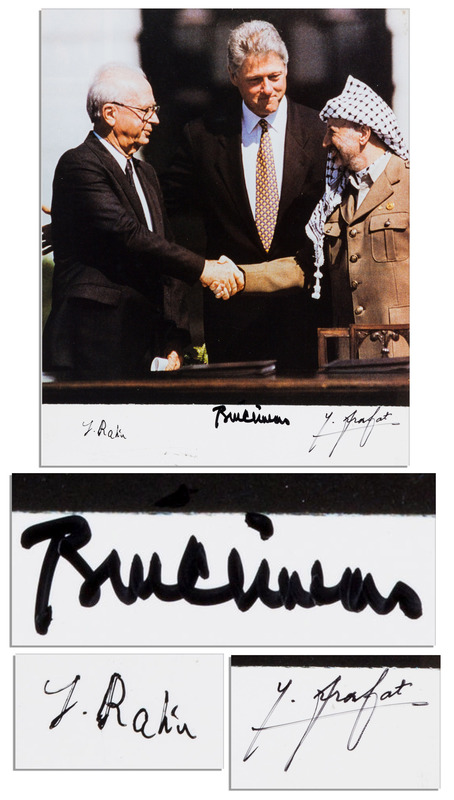 President Bill Clinton, Israeli Prime Minister Yitzhak Rabin and PLO Leader Yassir Arafat signed photo. Crisp color image of the heads of state is signed ”Bill Clinton”, ”Y. Rabin” and ”Y. Arafat” in black felt-tip upon the lower photographic border. Image was taken at the White House at the signing of the Peace Accords or, ”Declaration of Principles on Interim Self-Government Arrangements,” on 13 September 1993. Glossy photo measures 8” x 10”. Near fine. One of the very best Bill Clinton memorabilia items in existence. Sold for $6,250. 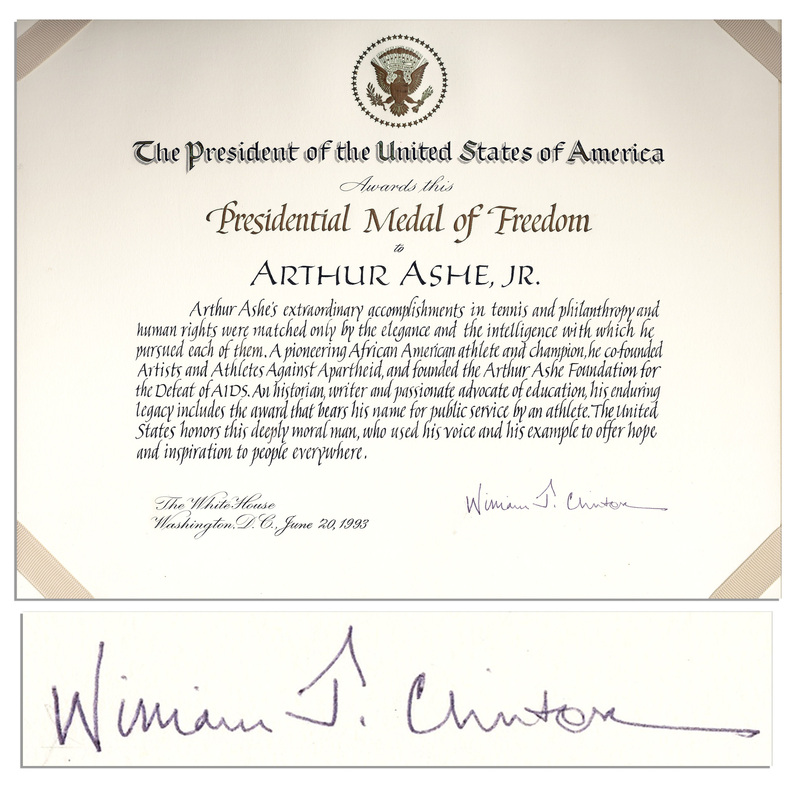 Arthur Ashe’s Presidential Medal of Freedom citation signed by Bill Clinton as President. Clinton honored Ashe posthumously with the United States’ highest civilian honor, signing ”William J. Clinton” at the lower right. Document, dated 20 June 1993 reads in part, ”Arthur Ashe’s extraordinary accomplishments in tennis and philanthropy and human rights were matched only by the elegance with which he pursued each of them…The United States honors this deeply moral man…” Measures 14” x 11”. Stately certificate in near fine condition is tucked into a blue leather portfolio lined in cream silk moire. Some scratches and creases to exterior, else near fine. With an LOA from Arthur Ashe’s widow. Bill Clinton memorabilia obtained directly from Arthur Ashe’s estate. Sold for $3,493. Very rare autograph letter signed by Bill Clinton as President, dated 29 August (1993). 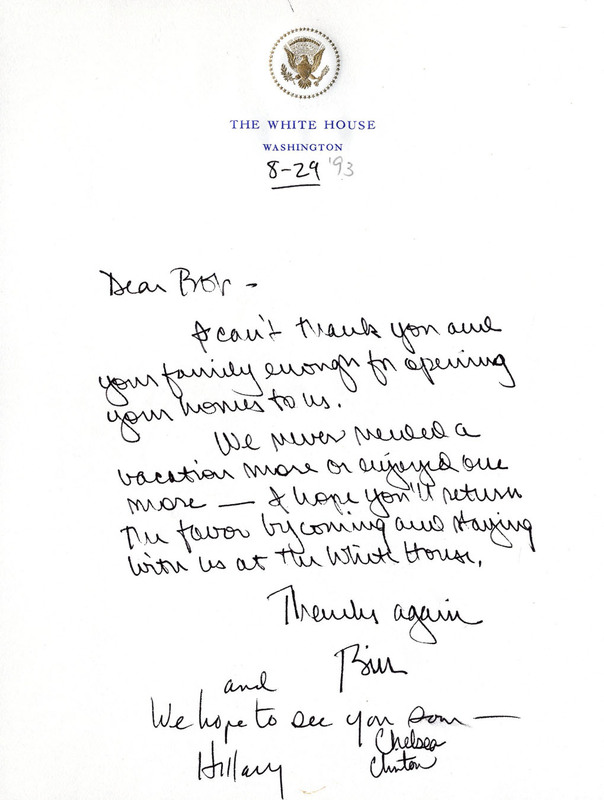 Upon White House letterhead, Clinton writes, ”Dear Bob – I can’t thank you and your family enough for opening your homes to us. We never needed a vacation more or enjoyed one more — I hope you’ll return the favor by coming and staying with us at the White House. Thanks again / Bill”. Hillary adds, ”and We hope to see you soon — Hillary”. Chelsea also signs her name, ”Chelsea Clinton” at the bottom. Letter comes from a larger lot of Robert McNamara items and was thus identified. Though Bill writes the date of ”8-29”, the year ”’93” is written in pencil in another hand, possibly by McNamara. Single page letter measures 6.75” x 8.75”. Single fold, else near fine. Autograph letters signed by Bill Clinton as President are quite scarce. Bill Clinton memorabilia originally obtained from the Robert McNamara estate auction. Sold for $3,125. Bill Clinton typed letter signed as President. 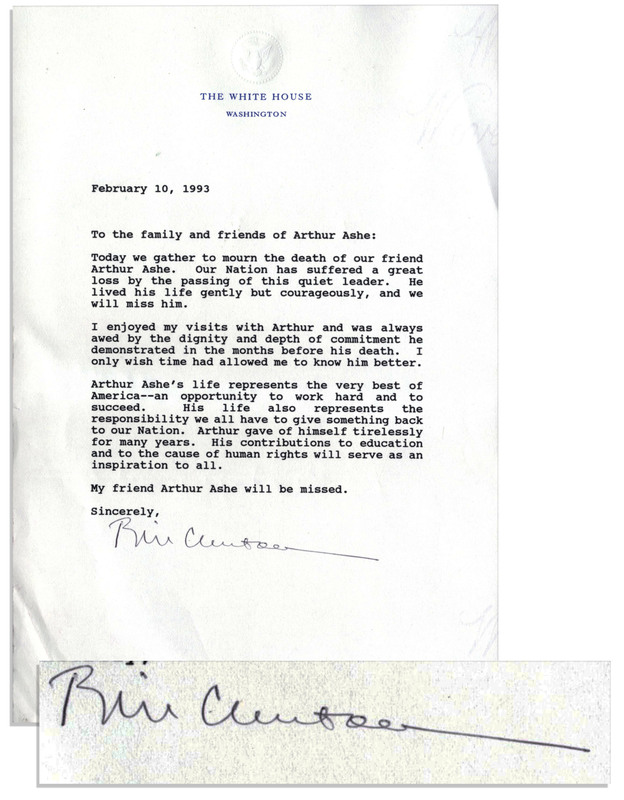 In this letter, dated 10 February 1993, Clinton reaches out to the mourning family of Arthur Ashe, who passed away on the 6th. On White House stationery, it reads in part: ”…I enjoyed my visits with Arthur and was always awed by the dignity…he demonstrated…” 1pp. letter measures 7” x 10.5”. Creasing to left side, else near fine. With an LOA from Arthur Ashe’s widow. Bill Clinton memorabilia obtained directly from Arthur Ashe’s estate. Sold for $1,969. Unique Bill Clinton typed letter signed as Governor of Arkansas, dated 7 November 1988, on State of Arkansas stationery. 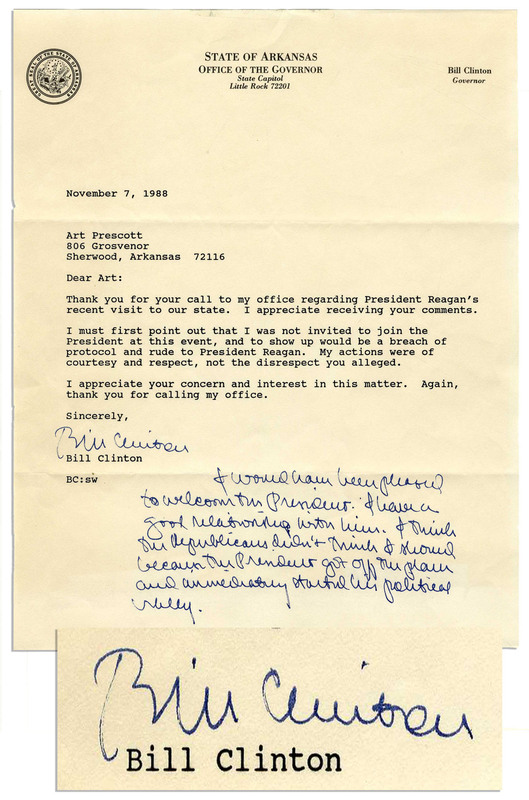 Letter details Governor Clinton’s reasons for not attending an event hosted by President Reagan during the President’s visit to Arkansas. Letter also includes a rare handwritten postscript that reads in part: “…I would have been pleased to welcome the President. I have a good relationship with him…” Letter on one page measures 8″ x 10″. Overall fine condition. Sold for $1,456. White House used china plate from the Clinton administration. Salad plate is part of the 3600-piece collection by Lenox of Trenton, New Jersey, the service commissioned for the 200th anniversary of the White House in the year 2000. This collection broke ground as the very first to incorporate an image of the White House itself on official china; it supplants the traditional presidential seal design on the service platter. 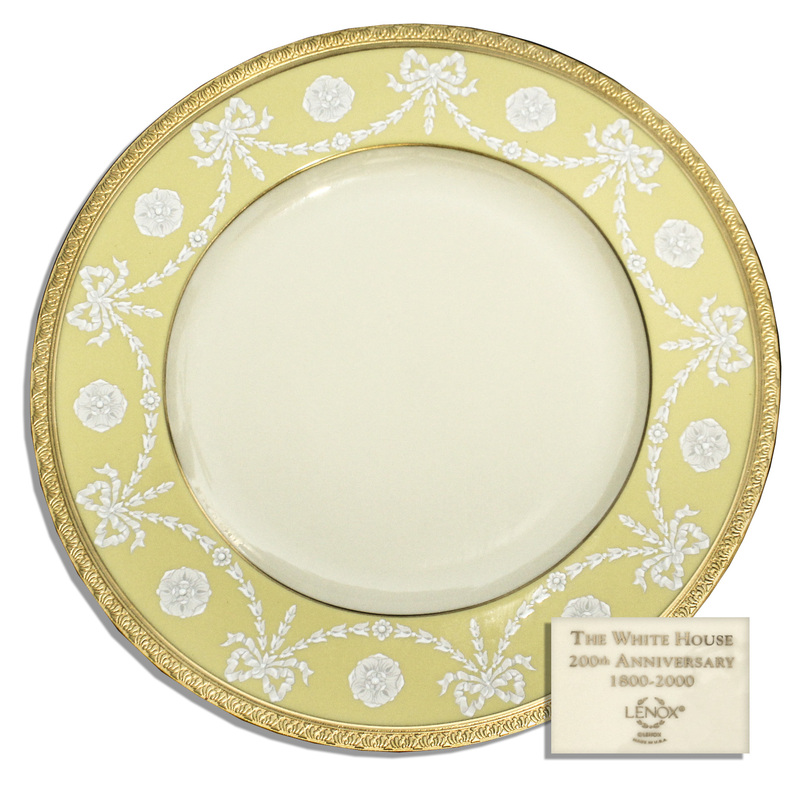 Salad plate features an embossed gilt border, and then a yellow border with a floral and bow design in white and grey. Backstamp reads, ”The White House / 200th Anniversary / 1800-2000 / Lenox / [copyright] Lenox / Made in USA” in gilt. Measures 9.25” in diameter. Fine. From the Raleigh DeGeer Amyx Collection. Fantastic White House Bill Clinton memorabilia. Sold for $1,000.